This entry was posted in Gardening and tagged california drought, California grey squirrels, growing pumpkins, self-seeded pumpkins, squirrels, watering pumpkins. Bookmark the permalink. Those squirrels are endlessly entertaining. Adorable squirrels! Very nice pictures, October will be here before we know it. Thank you, Karen. I always look forward to spring and fall. Sara! So nice to see you here. How are the flood renovations coming along. What a world-class drag, especially after all that beautiful work you’ve done. I’m excited about that first, perfectly formed pumpkin, and hope the others get time to fruit before the days shorten again. Cathy, it even grew onto the paver so it’s not sitting in the soil. I’m so excited. Nature…including its squirrels…has its way! Happy pumpkin growing! Thank you! I love the way they take off this time of year. In a blink, it seems, they triple in size. Exciting times ahead. This year is going too fast! Your Halloween is just around the corner. Yikes! It’s hard to believe we’re on the third week of July. And with schools starting earlier, my youngest son is back in the classroom August 14th. Yikes! Squirrels (grey ones at least) are much maligned in the UK. So refreshing to see them being ‘treated’ like this! I look forward to your carvings in a few months time! Thank you! Not everyone likes them here either, but I’ve always loved all animals, and believe we can make room for all of us. We’ve so completely encroached on a wilderness that was once theirs. It seems heartless not to make some room. What a wonderful, kind, whimsical soul you are! I just adore you, Alys. And something tells me your local squirrels adore you too! Thank you for the biggest smile I’ve had all day. …and cooking and eating them? Only as a pumpkin-loving cook, I find it hard to see the lovelies given away to the creatures. It’s a big staple in my diet, and I’m lucky to live where they can be had year round. How wonderful that you can grow them year round, Kate. What is your favorite way of preparing them? We once roasted miniature pumpkins, then filled them with something I’ve since forgotten. I should make an effort to do this again. Oh yummy! That sounds wonderful, Kate. Well I think you will be out shopping for some orange hued tutu fabric very soon, if not immediately! I think you could make every pumpkin a beautiful dress and turn the entire garden into a fashion parade and a successful harvesting venture. What fun 😀 And you took such lovely photos of the squirrels too, they are very cute! Pauline, those orange, mesh, tutu’s are a riot. You’ll be happy to know that within a day of reading Lisa’s post, I got out some netting from my garden stash and mostly wrapped the pumpkin. The vines are easily broken and the stem is resting on the fruit, so it was more of a tucking in then a complete surround. Lets hope it does the trick. I do like the idea of a garden fashion show. 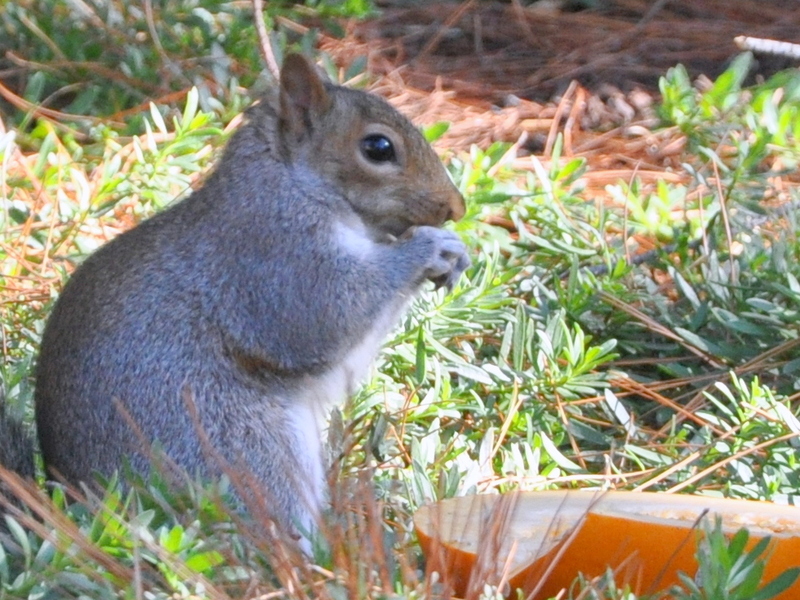 I have so much fun photographing the squirrels. They’re such busy critters, too. They chase each other along the fence, round and around the pine tree, and to my neighbor’s chagrin, they are nesting under her solar panels. I hear them running across our roof, watch them leap from the tree to the roof, and occasionally I spot one drinking from the fountain. 🙂 My pumpkin has a blankie! Anne, I’ve got to make a concerted effort to cook with pumpkin this year. Thank you for encouraging me along with Pauline and Kate. This one’s a beautiful specimen. I hope there are more to follow. I’m having such a good time. Fabulous photos! Fall has always been my favorite time of the year, too! It must be extra nice to dream of crisp days during your heat wave! Marlene, I like your current motto: It’s not 90 yet. We should get t-shirts. In Canada we often complained at having to wear a warm coat over our Halloween costume. It could be quite cold, windy and possibly raining. Here we’re lucky to see it dip down into the seventies. Different times, different places and vastly different changes to our weather. Sending you cool-weather vibes. Thank you! I’m happy to have both. Your pumpkin crops are so amazing! And the squirrel pictures are very cute. I like the way you lured them in. It will be nice if you get a good crop again! Thank you, Lisa. I think they’re adorable. Amazingly, they leave my tomatoes alone, and they’re not interested in basil either. They have been snapping off the sunflower heads, which makes no sense, since they haven’t yet gone to seed. Apparently they like the flower heads, too. Interestingly, it’s a bit like pruning. Wherever they’ve snapped off a flower head, a new one is appearing below! I also like roasted pumpkin (although I prefer the taste of butternut squash given the option) and soups made with it but I’m not keen on it in anything sweet. I know pumpkin pie is a big ‘American’ thing though – do you deprive the wildlife every now and again and have a big baking day? I’m not much of a baker, sad to say. You all put me to shame. My husband enjoys cooking, and makes us some hearty soups come winter (carrot and butternut squash are two favorites). I must make more of an effort. Hello Dawn! Thank you. These pumpkins are a real bright spot in this hot, dry summer. Is your growing season receptive to growing pumpkins? I’ll be you love October almost as much as I do. Our neighbors grow pumpkins in their gardens. They should be big this year since we have had lots of rain! We have never tried to grow our own. We always look forward to a drive out to the countryside to ‘pick’ our pumpkin each October. It’s such a special time of year! Dawn, that sounds like a wonderful tradition. When our boys were young, they would pick a pumpkin from a local “patch”. Sometimes it was out in the country, other times it was more of a fenced off corner of a lot with huge slides, snacks, bales of hay and pumpkins. My boys loved pumpkins too. It is a special time of year. You are the queen of pumpkins and the squirrels are your hand maidens! I’m glad you are getting such a crop this year, because it makes you so very happy! How very nice Alys. I hope you get a bumper crop. I love your invitation to your squirrel friends (especially after they ate your swing cover) how kind of you to share. In Montana they ate the whole pumpkin. I guess the CA squirrels are a bit more picky about flesh than the plains squirrels are 🙂 !! I too like the squirrels. I like to watch them and feed them. I even have a feeder for them and I keep it nicely stocked. WHICH is why I get so dog gone angry with the little pests when they insist on tipping over the bird feeders and dumping them out and throwing them in the yard and just making general, naughty little pests of themselves. As they have done at your house they once destroyed a beautiful swing we had and they can be horrible, ungrateful little beasts. But it is hard to be mad for very long ’cause they are so very cute. I do love the birds too though so it makes me sad the squirrels won’t share well. I have tried almost every trick out there. I have avoided the pepper in the food trick. I just don’t like it. It seems mean, and since I don’t care for spicy food I think I am sensitive to the idea of feeding hot things to others unaware. NOT NICE!! We are getting ready to go to HI to see our daughter but when we come back Stephen says he will try to make a baffle for the feeder pole. I do hope fall is right around the corner as the 100 degree days are no fun. Take care friend and good luck with your crops. Amy, you have some adventurous squirrels out there. I’m smiling, both at your frustration and your kind heart. We use to put squirrel food in a feeder box on our back fence, and then feed the birds in the front. We hung the feeder from a long, metal hook from the side of the house and that mostly did the trick. Funny aside, though. I got up in the middle of the night once for a drink of water, and must have heard a noise outside the kitchen window. It was a rat, happily eating from the bird feeder. They’re a resourceful lot. My neighbor started feeding the squirrels, and they buried all the excess peanuts in our garden, so we stopped feeding them knowing they were getting far more than they could ever eat. We’ve had two baby squirrel releases in our garden over the years. That’s pretty special, too. Everyone is just trying to get by, eh? Have a terrific time in HI (how could you not!) Stayed tuned for pumpkin updates. oh heavens those little munckens are so so cute! We have several visiting the yard and some are babies (I think). They clean out my bird feeder everyday. One little one ran up and down the fence, bouncing over posts and stopped to look right at us. I said, “Hello” and he stood up to get a better view. I could watch them all day long! There’s one chirping just now 😀 We’re outside in the garden, listening to the fountain and enjoying a Gin and Tonic 😀 Life is so good. I’m so excited for you, Alys! If I knew nothing else about you, I’d know about your love for pumpkins. I’m keeping my fingers crossed that the critters stay away, and I’ll be looking for updates. Thank you for your good garden vibes, Laurie.